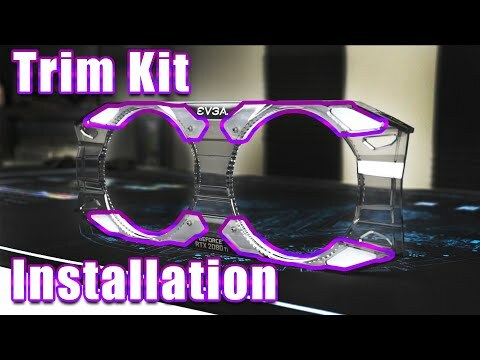 Product Overview Add a flair of colour to your Triple Fan EVGA GeForce RTX 2070, 2080, or 2080 Ti FTW3 Graphics Card, with this official EVGA Trim Kit. Coming with Four Red Trims & Four White Trims, you can mix & match to achieve the desired look for your EVGA RTX FTW3 card, whether you want to enhance your systems colour theme, or be bold by going for a striking contrast. A great way to individualise your GPU, the EVGA Trim Kit is compatible with all three models of EVGA GeForce RTX 20-Series FTW3 Graphics Cards with Triple Fans. Features • Add a splash of colour to your Triple Fan EVGA FTW3 GeForce RTX 2070, 2080, or 2080 Ti. • Mix & match to your preference or system’s theme. • Includes 4 Red Trims & 4 White Trims. • EVGA GeForce RTX 2080 Ti FTW3 ULTRA GAMING, 11G-P4-2487-KR, 11GB GDDR6, iCX2 & RGB LED. • EVGA GeForce RTX 2080 FTW3 ULTRA GAMING, 08G-P4-2287-KR, 8GB GDDR6, iCX2 & RGB LED. • EVGA GeForce RTX 2070 FTW3 ULTRA GAMING, 08G-P4-2277-KR, 8GB GDDR6, iCX2 & RGB LED. Important – Please Note: Images for illustration purposes only. Graphics Cards not included, available separately.